A recliner is a form of chair with an adjustable back, reclining function, and some footrest for the best body comfort and support. However, some people find it hard getting the best recliners due to their body size and height. This is because these recliners have been designed for an average body size. In a such case, you’ll end up having your knees hunched up above your ears and your head hanging over the edge of the recliner. An ordinary recliner also increases discomfort when you’re getting off since it’s too low for your body. Although recliners designed for tall people are rare, there are still some that take care of their comfort, and that’s the focus for this review. This review focuses on special features that should help you get the correct model for your needs. Weight capacity of a recliner is something to look at to ensure that it can hold up your body weight without buckling. Back height is also of importance in this text so that a recliner can adequately support the head and the neck of at all user. The review also focuses on the seats for spaciousness and comfort, and weight and dimensions of a recliner for storage and portability. If you’re looking for a recliner to suit your needs, don't worry as this text will answer most questions you’d have about best recliners for tall users. In as much as back height and spacious seat are important, don’t overlook the cover material for ease of cleaning and durability. This is a recliner model that embodies masculinity and comes with all the features that a tall user would wish to see in a recliner. While a majority of recliners designed for tall people can hold up an average of 350 pounds, Lane Home Furnishings Stallion Recliner can hold up to 500 pounds. It is reinforced by a welded steel coil base spring and comes with welded steel frame supports on the arms. Tall people can rest their heads comfortably on the extra 26” high back support. The recliner features an 8-gauge steel reclining mechanism that stretches fully to about 79” in length, which is equivalent to the full length of a king-size mattress. You can use the lever on the side to adjust the seat into several positions. You can use the wall saver mechanism to get more sitting space in a reclining position. This recliner comes with a heavily padded seat that measures 21”x25” (DxW) giving you sufficient room for comfortable sitting as well as leg support. The permanently fixed cushions are designed with high-resilience foam to give you more comfort. Featuring as the best recliner for tall users, the Lane Home Furnishings Stallion Recliner is designed with soft fabric that’s stain resistant, therefore easy to clean. The fabric comes in several colors that are important to blend into your furniture and home décor. More features- the recliner comes with a remote control system as well as a back-up battery. It also features dual motors that control the back and the footrest independently. 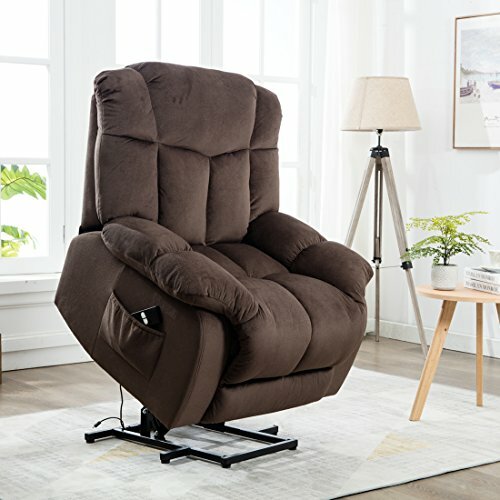 This is undoubtedly the best recliner for tall users and blends functionality and style into a unique product. This recliner model will take you to a nirvana and its poly-fibered upholstery that comes with a faux-leather look gives you a smooth and comfortable seating and a premium look. Users with heavy body weights can benefit from this recliner as it can hold up a maximum of 300lb. and is designed with a strong metal frame, while tall users can take advantage of the extended seat, back, and footrest of 20”, 22.5”, and 19.5” respectively. The recliner is just comfortable and very supportive. The recliner’s armrests are topped with plush and soft pillows allowing your hands to be comfortable all the time. A well-padded seat reinforced with steel gives you a specious seating of up to 19” wide. The recliner also features a power-lifting mechanism that allows users to lower the seat and adjust the chair in different positions up to a flat position of 69” when reclined fully. A dual motor system allows for independent movement of the footrest and the back. You can comfortably activate and control all these functions, as well as the power lifting system using the buttons on the accompanying remote control. In addition to the remote control, there’s included a battery pack under the seat in case of an emergency power outage to guarantee you maximum rest and comfort all through. Detailed installation and assembly instructions, hardware, and tools are also included in the package. The battery pack needs 2 separate 9-volt batteries, which you can buy separately. This recliner is available in saddle brown and black colors. It has been rated highly on amazon with very few complaints received concerning it being too deep and firm. Weight carrying capacity- 300 lb. More features- the recliner is remote-controlled and comes with a power cord. 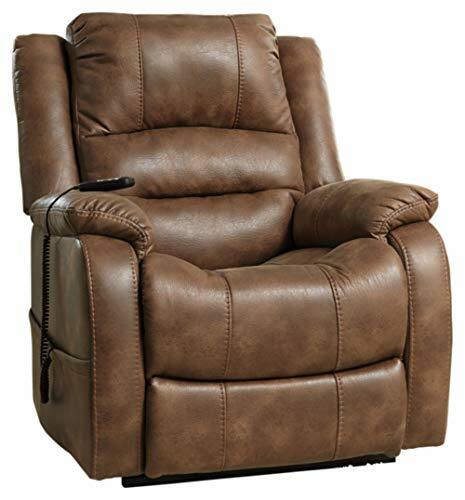 With a weight carrying capacity of about 300 lb., this recliner model is ideal for tall and big users. Although other models with this kind of weight carrying capacity come with dual motor system, this model features a single motor and a strong metal frame to achieve this weight capacity. You can recline this unit to lay back and use the electric power lift function to get up and leave the seat. This feature would be a good one for users recovering from an injury, the elderly, and anyone else who would need extra help to get up. 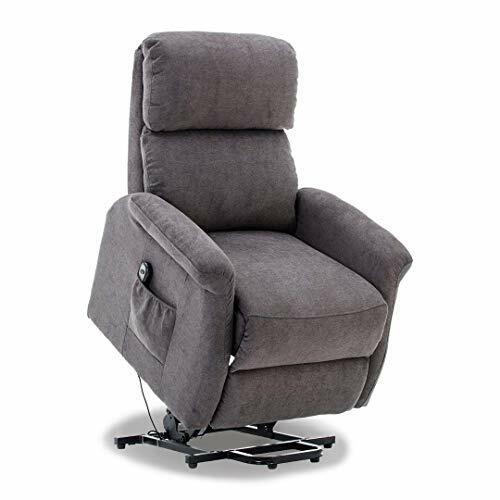 The CANMOV Power Lift Recliner back height of 17.7” that is a bit shorter compared to the back height of other recliners is ideal for short users. The seat is suitable for a majority of body sizes and at a height of 20.5” is sufficient to support long legs. The back, seat, and armrests are upholstered with anti-skid fiber. The thick foam cushion is made from polyester and is topped with a high-density sponge to give you ultimate comfort. This recliner features a side pocket that serves as a convenient storage for newspapers and magazines. An accompanying remote control with 2 buttons is ideal for reclining and lifting the chair. The package also includes a power cord. The unit is available in multiple colors to fit in most of your home décor. More features- 2-button control, relines and lifts, odor-free. If you’re looking for the best remote-controlled recliner for tall and big users that’s comfortable, affordable, and designed with a durable fabric cover, then this should be your choice. The recliner can accommodate any user of about 300 lb. and gives tall users adequate neck and head supports with its back height of 21”. The seat is 20” high with an extensive leg support. This model features a steel lift mechanism that lifts and tilts the seat forward to allow a user to slide out if he or she wants to stand up without straining their knees and backs. The package includes a 2-button remote control to recline or lift the seat in three different positions for extra comfort. A side pocket provides you convenient storage for the remote control, phones, magazines along with other essentials you might have in the house. The upholstery comes in a linen-like fabric that is soft and durable. The unit is available in various colors to blend into your home furniture. A majority of buyers find the unit easy to assemble. It comes with a generous warranty that covers the reclining mechanism and the frame for three years and one year for the fabric. However, some buyers note that the cushion becomes lumpy after a while, and considering that it’s not removable, it’s not possible to flip it over. The massage and heating functions of this recliner are among a few things that can add some comfort and luxury to a recliner chair. Featuring a maximum of five massage modes with two adjustable levels of intensity as well as a heating mechanism and an option to choose part of body or the whole body to massage, this unit takes pampering and comfort to the next level. The eight vibration intensities massage your thighs, back, lumber, and legs for about 25 minutes before the in-built auto-off feature switches the massager off automatically. You can however toggle the integrated heating system on or off to warm and sooth sore muscles. This is an important feature to improve blood circulation. Featuring as the best recliner for big and tall users, the WATERJOY Massage Recliner Chair is equipped to hold up to 300 lb. of weight and its seat and back are 20” and 27” respectively sufficient to accommodate your, neck, legs and back comfortably. You can adjust the backrest to a number of reclining positions for extra comfort by using the lever located on the right side of the seat. The reinforced steel base gives strong support while the sponge padding over the PU leather offers you a smooth surface to sit on. The cover material is easy to clean long-lasting while its black color conceals most stains. This recliner features a side pocket that’s essential for storage of items, such as your mobile phone and the accompanying remote control that’s used to choose your preferred massage setting and part of body to be massaged. Once you make your selection, an LED light will illuminate. The recliner is light-weight making it more portable and its assembly only takes a few minutes. As stated before, this review takes a deep dive into the important features to consider when choosing the best recliner for tall users and tries to expound on their importance. The review also lists the benefits you get from owning a large recliner and the next section will try to answer most frequently asked questions that buyers ask about the them. Recliners for tall and big people can be used by almost any body weight stemming from their high weight capacity, sufficient back height, and spacious seats. They are easily adaptable. The recliner’s spaciousness with adequate room to stretch, heavy padding and several adjustable positions, and full reclining ability, make them great alternative beds. A majority of recliners come with several cools features like heat therapy and massage, which collaboratively improve blood circulation and relieve pressure points. They also come with lift and tilt abilities which allow users to slid off the seat and stand without straining their backs and knees. This lift and tilt feature is perfect for tall users, the elderly, and those with limited mobility. The recliners are more comfortable considering that they are heavily-padded compared to regular-sized recliner models and come with sufficient support and cushioning. Recliners for tall people are long-lasting since they are made of strong materials like steel and hardwood to take care of the extra weight capacity. It can really be difficult for tall users to get the right recliner that will not cramp their legs or strain their backs and necks. Therefore, you should align the following search criteria with your needs and preferences. This way, you’ll be in a position to narrow your options to the correct model. Every recliner model has a specific weight capacity that should never be exceeded, and this is normally recommended by the manufacturer. You can get such valuable information the accompanying product’s manual, or on the manufacturer’s website. A recliner with a weight capacity of 250 lb. wouldn’t be the best option for a 350 lb. user. In this case, a recliner with 500 lb. weight capacity will be best. Therefore, you should buy a recliner with a maximum weight capacity that’s more than your current and future body weight. It’s obvious tall users will require recliners that are a bit bigger than the regular-sized ones. In addition, tall people come in various sizes just as recliners designed for them. In case you buy a recliner that doesn’t match your body size, then it will end up causing more harm than good. Then you should pay particular attention to the size of the recliner’s backrest, footrest, and the depth and height of the seat. Instead of supporting your head and neck, a short backrest will leave your neck hanging above the edge, which is more likely to lead to neck pain. You should at least start with a back that’s 20” high. On the other hand, seats that are too deep will dig into the back of your knees if you have short legs while shallow seats will only support your back in case you have long legs. Recliner seats that are too low from the ground will have your legs stretched over the footrest making it harder for you to stand up. Seats that are too high will have your legs dangling midair and you’ll have to jump on and out of the seat. You should start with a seat with a minimum height of 20”. In case you have wide hips, please check the width of the seat for spaciousness. A correct footrest should support your two feet without cramping your legs. A short footrest will dig into the back of your ankles and leave your feet dangling off the footrest’s edge. Weight and overall dimensions will dictate on ease of movement and the space occupied by the recliner. Cover material used to make a recliner determines its durability, ease of cleaning, and maintenance. A good material can save you money for replacement. A breathable and soft cover material will stay fresh and keep any user cool and dry. Leather and fabric are the most common materials for making recliner covers, but polyester is the most popular since it is washable and durable. Leather is stylish and easy to maintain since you simply need to clean it by wiping. Real leather is a bit expensive and this is why you should consider low-to-mid range models such as faux leather that’s made of polyurethane and PVC instead. 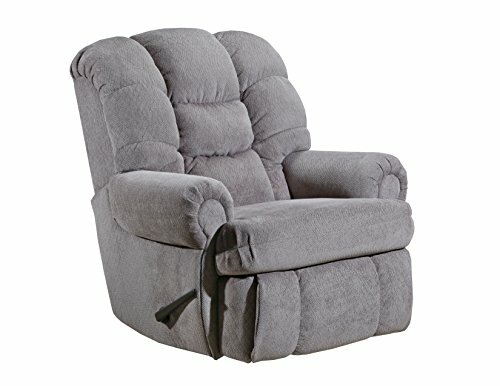 Buying recliners from reputable manufacturers is the only way to get a decent warranty. You should evaluate time, scope, and terms of the warranty before placing your order for an assurance just in case the recliner malfunctions or turns out to be defective. Review the manufacturers replacement and refund policy and whether it would be possible to extend the coverage. You should however beware of situations that could avoid the warranty, for example treating the upholstery with chemicals. 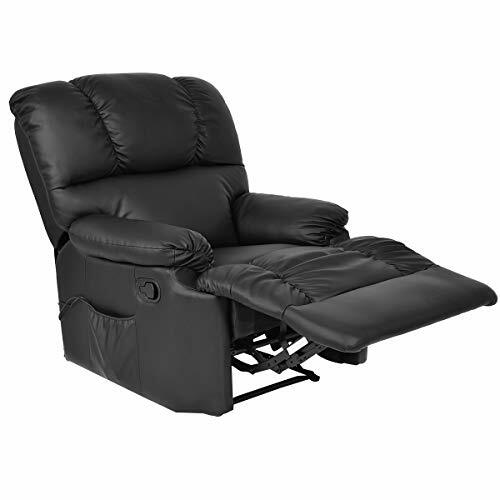 Multilevel reclining- a recliner with this feature gives you multiple positions for ultimate support and comfort. You can even recline some to a flat position and at 180 degrees. Number of motors- recliners with two motor systems operate the footrest and the backrest independently. USB charging- some recliner models come with USB charging feature that allows you to charge your phone without getting off the seat. Pockets - although becoming a permanent fixture on a majority of modern recliners, you should however make sure the model you buy has a side pocket to store your essentials. I am rather heavy- 270 lb. and tall. Won’t a recline breakdown when I recline? A recliner breaking down as you recline is a bit scary, right? Basically, all recliners on this list can take up a minimum of 300 pounds without breaking down due to their strong frames as well as base construction that’s reinforced with high-grade steel mechanism. They redistribute your weight when you recline, so no worries of a recliner breaking down. What model is best for users on the heavier side? Every recliner comes with a recommended weight capacity and this should guide you to buy the correct one. Should I seek some professional help when assembling the unit? This depends on the model you buy. Many recliners are easy to put together with a few tools and instructions provided by the manufacturer. However, for some you’ll have to get some professional help and extra tools. A recliner isn’t just any that you find out there. A good recliner should comfortably accommodate your height and body weight. You should check overall dimensions and maximum weight capacity of any recliner before buying. Don’t rush to buying a recliner that doesn’t suit your needs.